KeyShot 3D rendering and animation software is one of the fastest, easiest way to create amazing, photographic visuals of your 3D data. 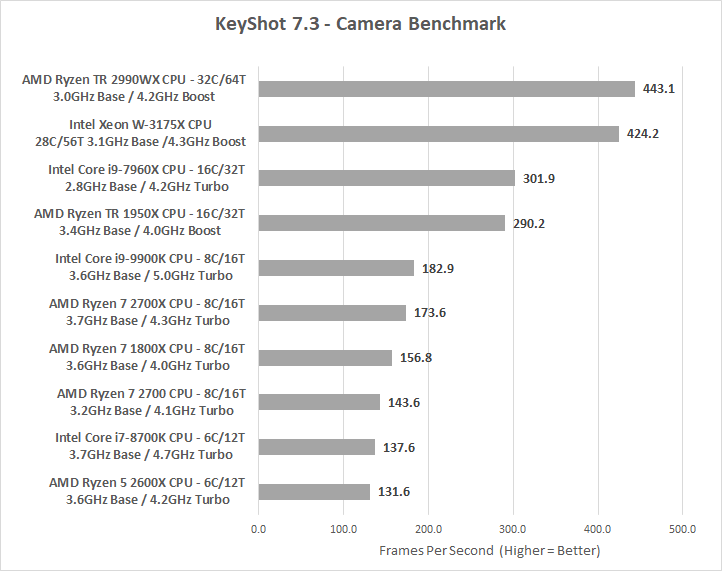 We installed KeyShot 7.3 to do some benchmarking and real-world stress testing using the camera_benchmark.bip scene that is included with the application. 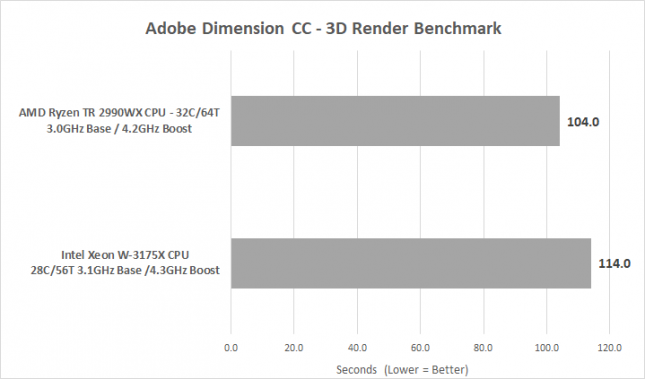 This benchmark tests a 800×554 pixel image with a continuous sample rate and shows the Frames Per Second (FPS) that the scene is being rendered from. This scene has nearly 42,000 triangles and does a good job at using all available cores to render the scene. Agisoft Metashape (formerly PhotoScan) is a stand-alone software product that performs photogrammetric processing of 2D digital images and generates 3D spatial data to be used in GIS applications, cultural heritage documentation, and visual effects production as well as for indirect measurements of objects of various scales. We us the 50 images from the ‘Building‘ sample data download page for our benchmark. We take the total time it takes to complete four steps: Align Photos, Build Dense Cloud, Build Mesh, Build Texture with all the default settings for each. Premiere Pro CC is the leading video editing software for film, TV, and the web. We took a seven 4K video clips and rendered one 4K H.264 movie at 29.97 FPS. 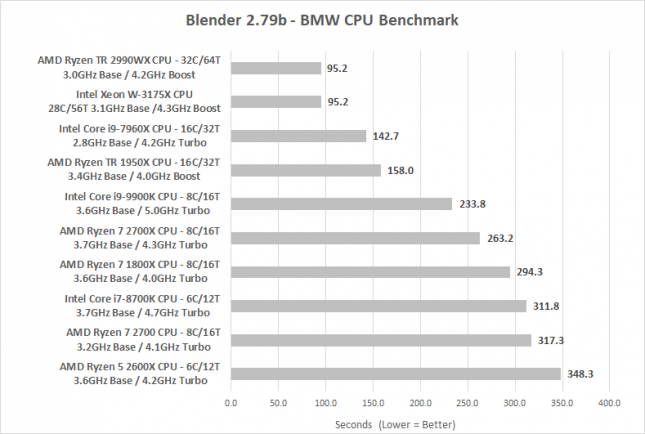 This is the first time we’ve done this test and are including results for just Threadripper 2990WX and Xeon W-3175X processors. Adobe Dimension (formerly Project Felix) is a photo-based mockup editor where models, photos and textures are created in third party applications before being imported into Dimension. Once in Dimension, models and images may be composed into arrangements before being rendered to 2D photo realistic images. We take custom 1600 x 1200 pixel canvas and render it at medium quality. Exported files include both PSD and PNG. This is the first time we’ve done this test and are including results for just Threadripper 2990WX and Xeon W-3175X processors. The Catalyst Production Suite, from Sony, comes with Catalyst Prepare and Catalyst Edit. These are two 4K-capable programs designed for production and post production. 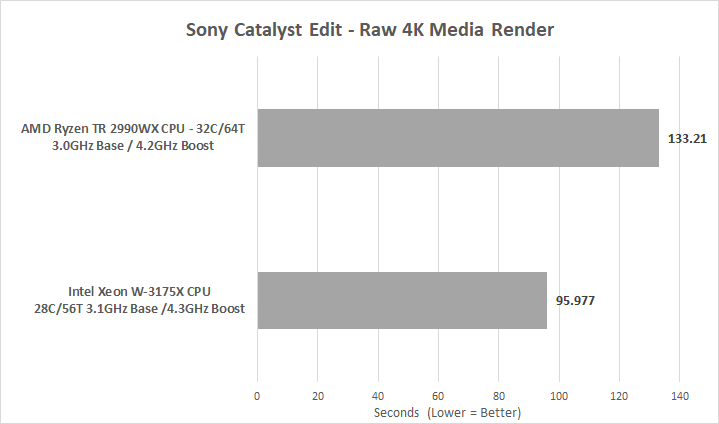 Catalyst Edit focuses on 4K, Sony RAW, and HD video editing and is what we ended up using for benchmarking purposes. We used Catalyst Edit to render, encode and export 3 video clips and a WAV audio track into one 4K video file. This is the first time we’ve done this test and are including results for just Threadripper 2990WX and Xeon W-3175X processors. 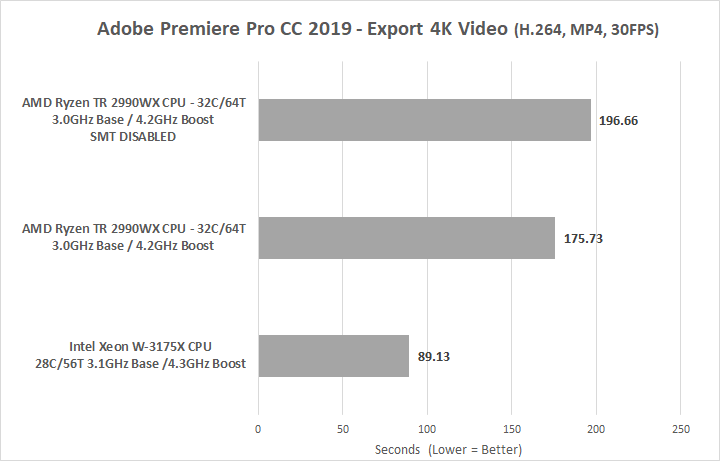 Real World Benchmark Results Summary: When it comes to our ‘real world’ benchmark tests the Intel Xeon W-3175X processor did really well on Adobe Premiere Pro CC 2019 and Sony Catalyst Edit 2018.2. 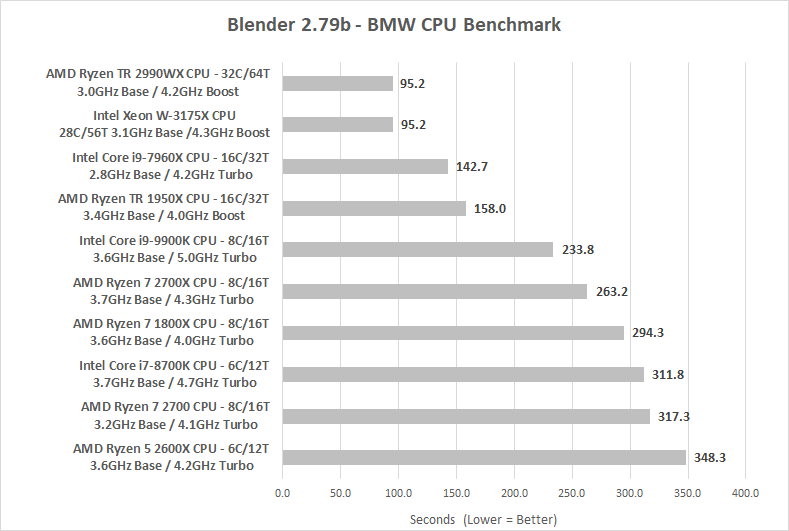 On Keyshot 7.3 and Blender 2.79b the 3175X was on par or slightly slower than AMD’s Threadripper 2990WX processor. 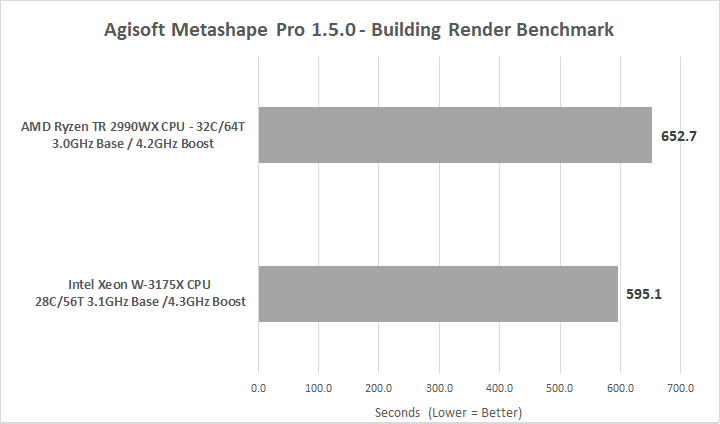 It should be noted that on Keyshot the Xeon chip is initially faster, but we take our measurement minutes into the workload where the boost clock doesn’t play a role in the outcome.